Throw the ground beef (cooked) into the crock pot. On top of that mix in your tomatoes, corn, black beens and chili powder. 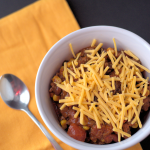 Toss on some cheese and grab a bag of scoopables and go to town on this delicious dish!